The U.S. Air Force's pilot shortage is likely to worsen in the coming years as the pool of eligible recruits continues to dwindle, Sen. Joni Ernst (R., Iowa) said Thursday. Speaking on military readiness at the conservative Heritage Foundation, Ernst, a combat veteran who serves on the Senate Armed Services Committee, said the Air Force has an "ever-diminishing" population of young men and women to pull from, as many are unable to meet rigid military recruitment standards. "It is going to be increasingly difficult because the pool of folks that we can recruit from is very, very small," Ernst said. "Most of those 17-to-24 years olds, the typical population that our recruiters target, they're not eligible for military service either because of the height-weight standards, physical fitness, substance abuse issues, law enforcement issues, you name it." Ernst said one way the military could enhance enlistments would be to grant waivers to those who are ineligible under current standards, though she was hesitant to endorse that route. "I'm not sure where I stand on that because certainly we need men and women who can meet the mission requirements," but "we have to find a way that we can entice people to serve their country." 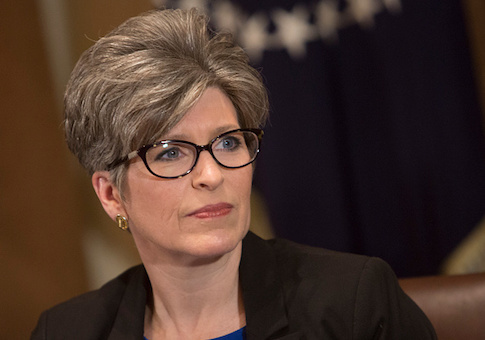 Ernst's comments came during a panel discussion on the Heritage Foundation's annual defense strength index released Thursday morning. The report rated the readiness of the Air Force as "weak" due in large part to a shortage of pilots and aircraft. The service is also facing a systemic lack of flying hours. The report says fighter pilots should receive an average of three flights a week and 200 hours a year to have the skill sets to survive in combat, but they've averaged less than two flights a week and 150 hours of flight time a year for the past five years. The trend is only worsening, with the report predicting that pilots will receive fewer than 140 hours in 2018. "The shortage of pilots and flying time for those pilots degrades the ability of the Air Force to generate the amount and quality of combat air power that would be needed to meet wartime requirements," the report said. This echoes testimony by Air Force Chief of Staff General David Goldfein, who told the Senate Armed Services committee last year that the service is "at our lowest state of full spectrum readiness in our history." Ernst said Air Force recruiters not only face service challenges, like the salary difference between military and private sector jobs, but cultural challenges as well. "Many of us joined the service because we believe in our country and we have this sense of patriotism and want to project our ideals and values around the globe," Ernst said. "Sometimes I wonder, are we teaching that today to our young men and women? Do they understand that they live in the world's greatest country? Sometimes I get the feeling that they don't appreciate this wonderful land." This entry was posted in National Security and tagged Air Force, Joni Ernst. Bookmark the permalink.